“The more Modiji talks about the things his government has done for farmers, the more the BJP (Bharatiya Janata Party) will lose here,” says Vikas Soppin, an engineer, with a degree in marketing, who is now a farmer activist. He was referring to the Prime Minister Narendra Modi’s speech at Gadag two days ago where Modi said the Congress had paid only lip service to farmers. To say that farmers in North Karnataka are facing a crisis is an understatement. The poignant story of 50-year-old Vittal Arabhavi caught the attention of farmer activists in the entire country. “It was 2013. we were agitating for a farm loan waiver in front of the Suvarna Soudha in Belagavi (the legislative assembly holds sessions in both Bengaluru and Belagavi, formerly Belgaum). "Vittal Arabhavi came to the stage. He didn’t say much: Only that he was a farmer. He owed money because he hadn’t been paid. He hoped the chief minister, who was from his own caste, Kuruba, would do something for him. "He got off the stage and went to the back. And, there he drank poison. He died that evening. That death shook everyone up. "But, despite that, there has been no structural intervention into the crisis in agriculture that faces this region,” Soppin said. Arabhavi had reportedly sold 120 tonnes of sugar to a company owned by Murugesh Nirani, a former minister but the farmers alleged that he had received just partial payment. His family, comprising three daughters and two sons, had no means of sustenance. Nirani, however, denied the allegations, saying that the farmer had sold only half his produce and a partial payment had been made. Soppin said little had changed since then. Farmers continue to face a problem of delayed arrears from sugar mills. And, because so many sugar mill owners are politicians, there is an unspoken pact among all political parties to push this issue under the carpet. North Karnataka is the granary of the state. Agriculture is the primary occupation. The region grows toor dal, sugarcane, cotton, green and black gram, wheat and green chilly. The state government charges only a nominal rate for agricultural power and lately, power cuts have not been that frequent. 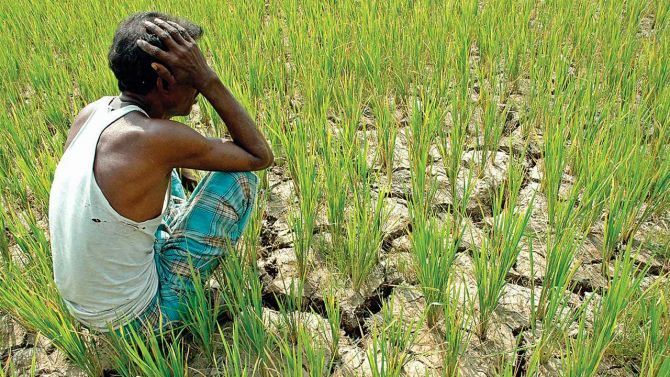 About six months ago, debts of farmers who had taken loans below Rs 50,000 were written off. But, that is secondary. Soppin and others said what the farmers needed was a Pradhan Mantri Fasal Bima Yojana - one that actually works. Why do farmers need insurance in the first place? While the dependence is on rain-fed farming, irrigation canals and hydro electric projects (like the contentious Mahadayi) do exist. But, Karnataka can never utilise the entire water that is due to it - because it does not have the storage capacity. Creating storage would require land of the order of 100,000 acres: Which is impossible. The next best option is that when the rains fail, the state - the central and the state government - provide a financial cushion for the farmer. When the Pradhan Mantri Fasal Bima Yojana (PMFBY) was launched in 2016, farmers in North Karnataka paid a premium amounting to Rs 89 crore. It seemed like a good deal. The premium rate for kharif crop was 2 per cent, for the rabi crop was 1.5 per cent and for commercial crops was 5 per cent. With such a low premium, the farmer thought he could recoup his losses. The compensation paid to farmers in 2016, after the state government declared drought in North Karnataka, was around Rs 15 crore. “With great difficulty, after prolonged agitation, we have managed to secure compensation to the tune of around Rs 28 crore till date,” Soppin said. Farmers said the reason was extensive loopholes in the PMFBY for which both the state and the central government were responsible. The state government had farmed out the job of ascertaining drought and crop failure to three or four departments. Their data were invariably faulty and incomplete. The insurance companies responsible for the payout depended entirely on the statistical data provided by the state government. And, the Centre refused to countenance anything less than full data. “The chilli crop of farmers failed. The rule is that the statistics collection department of the state government has to send a sample of three cuttings to insurance agencies to show the crop has wilted. "After the first cutting, there were no other cuttings, because the plants just died. The state government is unable to address the requirement of the insurance companies. "They, in turn, cannot provide compensation because they will not get the money back from the Centre. "So frankly, when leaders say the PMFBY is a great hit, their words have no credibility with the farmers in North Karnataka,” Soppin said. If there is anything Modi is identified with in these parts, it is neem-coated urea - farmers say that now, at least, people will not have to drink poisoned milk because cattle has been eating feed contaminated by urea. The crash in commodity prices especially toor dal hit the region hard: It is one of the principle crops. But, if the state government has done little for farmers, the central government is even more liable - because it is pretending to show concern though it feels nothing for the cause of farmers. “In the circumstances, caste-based voting will prevail. We have failed to make farming an issue in the elections” Soppin said.